This international code signal is used as an appeal for help. This is what we should all adopt as our new mantra; help those in need that cross our paths, even if they can’t help us back. No good deed should be ignored or excluded because there is nothing in it for ourselves. With so much suffering and disadvantage in this World, why wouldn’t we want to help when we can or when we see an opportunity come our way! There is nothing that makes a heart grow stronger than putting a smile on someone elses face because of a good act of kindness. Generosity doesn’t always mean you have to donate or give your money away. An act of generosity simply means that you can be unselfish, kind, caring and honourable to another human being. This World needs more of that. If every one of us pitched in and made one gesture of kindness a week, big or small, what a difference it would make to the energy of this planet. People would stress so much less. There could be a mutual understanding that someone, somewhere would be there to lend us a hand if we needed it. There wouldn’t be a need to feel lonely. There would be a feeling of unity among us. An deeper understanding of oneness perhaps. All of us, each and every human being on this planet has a Soul. Why can’t we be more sympathetic, tolerant and considerate with one another? Why do we always have to be judging each other? What right do we have to form an opinion or conclusion about another person when we don’t walk in their shoes! Some of the people we might have a chance to help someday might not even have shoes. Don’t turn and look the other way when a beautiful opportunity to help, aide or assist a fellow human comes your way. Don’t cross the street to avoid someone in need. Please don’t pretend to be oblivious to someones cry for help. 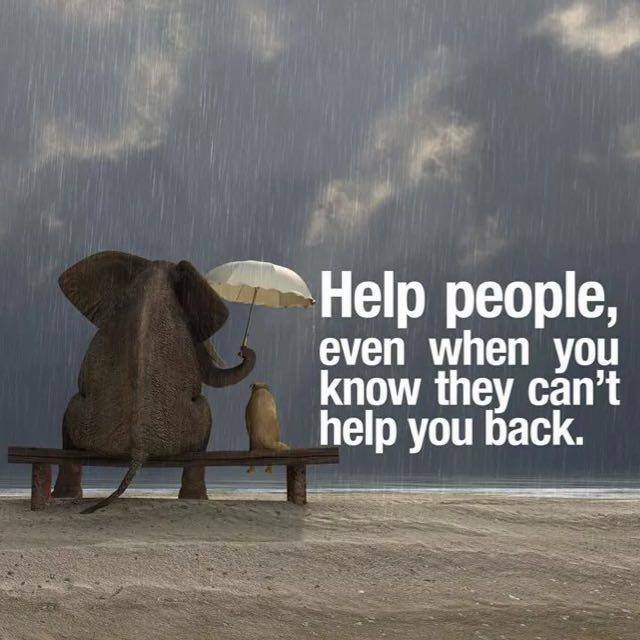 Remember your new mantra – help those in need that cross our path, even if they can’t help us back!! The warmth in your heart will put a smile on your own face, one that will match the smile of the person that you helped.